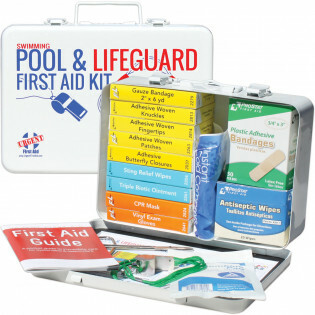 Our Swimming Pool First Aid Kits with CPR (great for Lifeguards) Pool and Lifeguard First Aid Kit with the products needed for insect bites, minor cuts & eye irritations. Our lifeguard kit provides CPR one-way valve face shield to protect rescuer when performing CPR. Products contained in a strong metal case with gasket for water resistance.